Save space with the Seville Classics 15-Drawer Organizer Cart. Constructed with industrial-strength tubular steel finished in chrome, the cart features tall, easy-to-grab handles and a removable perforated steel top shelf. 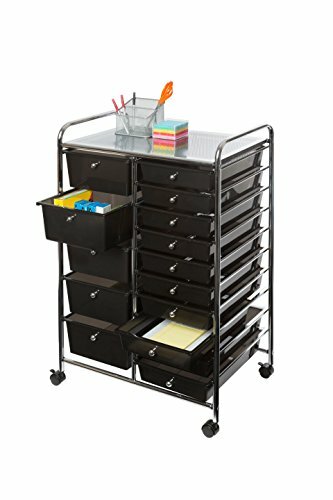 Cart includes 15 removable polypropylene drawers in opaque black with chrome drawer pull knobs. Get organized with 10 smaller drawers and 5 large drawer bins, making it perfect for storing both lightweight and bulky supplies. The interior of each drawer measures 15.2 inches long and 11.25 inches wide--deep enough to hold a ream of printer paper with space to spare. Each drawer can hold up to 3.3 lbs. while the top shelf can withstand up to 16.5 lbs.